Don Salvatore Leone is since long the head of the Leone Family. Salvatore had to endure several severe setbacks in various GTA's. As the head of the Leone Family he is in a continuous struggle with the Forelli Family. On top of that, he has to deal with the betrayal of CJ, Curly Bob, and finally also Maria Latore, his own wife. Being betrayed so many times, Salvatore became paranoid and thinks everyone will turn his back on him. In GTA III this is said literately by Curly Bob, a rat who works for the Colombian Cartel. Catalina responds with a sarcastic remark: "what is Salvatore worried about, with friends like you?" In 1992 we see a young Salvatore, with no grey hair. This is the year he meets his future wife Maria Latore. Salvatore came from Liberty City to Las Venturas for a joint venture with the Forelli and Sindacco Family, although Salvatore really wanted to prevent the other families from becoming to powerful in San Andreas. He also meets Carl Johnson, who he likes, since CJ did some jobs for his son Joey in Liberty City. These warm feelings disappear when CJ betrays him by robbing his casino. Salvatore swears he will kill CJ and all his offspring. 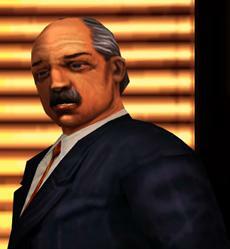 In 1998 Salvatore is back in Liberty City, where he likes the main character of GTA Liberty City Stories, Toni Cipriani. Toni has to rescue salvatore quite often from precarious situations and has to bring him to safety. Salvatore is very thankful to Toni and owes him. Salvator is also bothered by Jane Hopper, the person that leads the strike by the Ferry Terminal. He asked Toni to kill mayor Roger C. Hole. Once Miles O'Donovan is elected as the new mayor, he forces him to do what the Leone Family wants, to ensure the Leone Family stays in control in Liberty City. In 2001 Toni introduces Claude to Salvatore. Claude does some jobs for Salvatore, but after Salvatore heard that Claude had an affair with Salvatore's wife, he tried to kill Claude by luring him into an ambush. Maria prevents this, and Claude gets the assignment from Asuka to kill Salvatore to proof he has cut all ties to the Leone Family. Out of all mission bosses in GTA, you'll get the most missions from Salvatore. In the three GTA's where he appears, he serves you a total of 26 missions. By far the most of these occur in GTA Liberty City Stories. 'Salvatore' is Italian for 'saviour'. The name 'Leone' is of course derived from the mafia family Corleone. Whether the similarities between 'Salvatore Leone' and 'Sylvester Stallone' (an actor with whom voice actor Frank Vincent has worked in the past) is deliberate, is unknown. This page was last modified on 14 November 2011, at 17:37.